My roommate and I chose Holly Pointe Commons knowing that it was going to be the fresh and new housing on campus. Little did we know, at the time of choosing, that Holly Pointe promoted the growing concept and reality of all gender living. 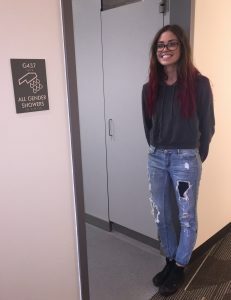 This gender inclusive lifestyle encompasses co-ed rooming and bathrooms, acknowledging the diversity of the student body by providing a safe, comfortable, and accepting living environment for all. When our friends discovered that we were planning to live in Holly Pointe, the first thing they questioned was, “How do you feel about the all gender bathroom situation?” This living environment didn’t even faze us until that question was constantly asked; considering this concept was different from every living situation we’ve previously have been offered at Rowan. We weren’t bothered by the all gender inclusive dorm rooms, but we started to wonder what it would be like sharing both shower and bathroom facilities with boys who lived on our floor. We had visions of the embarrassing moments of running from the shower to our room with nothing but our shower caddy in hand and wrapped in our skimpy towels, trying to avoid eye contact with any male we happened to come across. As you could probably imagine, we became pretty alarmed by this prospect. Just our luck, on move-in day we discovered our room was sandwiched between two male rooms and located directly across from the all gender facilities. 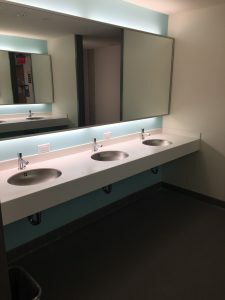 For the first week or so, my roommate and I would walk all the way across the hall to use the women-only facilities which are available at all times. However, with the three months that have passed, I now found myself using the all gender bathrooms without even a second thought. To my surprise, sharing a sink and mirror next to a fellow male resident isn’t at all weird or awkward. It now is just a natural and comfortable daily occurrence that doesn’t even cross my mind. So, when you’re considering which dorm is right for you, don’t let the conventional influences and questioning of others push you away from choosing Holly Pointe just because of its all gender living situations. Rowan University has done a great job of providing a state-of-the-art residence hall, giving options for gender inclusive housing in a traditional environment. It has been an eye-opening experience for myself, allowing me to step outside my comfort zone and step into an all gender residence hall!